Format: bilingual DVD, 3 eps., 62 min. Comments: Lot'sa demons and fighting. After FUNimation's release of the seventh Yu Yu Hakusho disc, "Rescue Yukina," I was a little disappointed in the eighth disc, "Dark Tournament." It's not that the eighth disc is terrible in any fashion; it just does not seem to live up to the higher standard of the "Rescue Yukina." As far as the narrative is concerned, "Dark Tournament," of course, comes right after "Rescue Yukina." The Spirit Detectives have saved the Yokai Yukina from an evil underground crime lord and defeated his cronies. However, Yukina leaves the group; this upsets Kuwabara, while Hiei's has not told Yukina that he is her brother. However, the Spirit Detective's boss, Koenma, has gotten word that the crime boss' strongest guards, the Togoro Brothers, weren't killed by Kuwabara. The Togoro Brothers come into the human world to threaten Kuwabara's sister and Yusuke's love interest, Keiko. To protect them, the Spirit Detectives must participate in the Spirit World demon tournament. 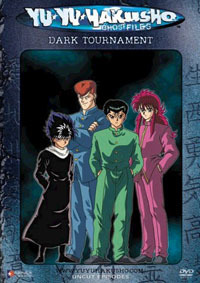 Kuwabara and Yusuke represent the human world and are joined by the demons Hiei and Kurama. Yusuke goes to train with his old master, Genkai, while Kuwabara trains with Hiei and Kurama. After two months of training, Kuwabara, Yusuke, Hiei, Kurama, and a mysterious stranger take the next ship to the Dark Tournament. Little do they know, they are not meant to be competitors, but rather sacrificial lambs. Little do the demons know that their sacrificial lambs have teeth. While the action remains fast and exciting, the plot in "Dark Tournament" seems rather contrived. Every Dragonball Z rip off has bizarre plot twists that function to have characters fight one on one. Almost always, this involves threats by the bad guys on the good guys' loved ones. It's the same plot we've seen since the original Dragonball. While certainly some of the anime classics invite copycatting, if one wants to see the same basic plot over and over, why not just watch the original (in this case Dragonball?) Of course, the action is the real draw in Yu Yu Hakusho and there are a number of good fights, including a battle royale on board the ship the detectives use to go the tournament. However, what could have been the best battle on the disc ends up lasting for less than five minutes and quickly gives way to a contrived one on one battle. The audio and visual qualities of the disc are standard. While nothing to write home about, the both the audio and visuals are good enough not to be distracting. Yu Yu Hakusho is an older anime (early 90s) and that shows through the show's somewhat unique character design (of which I'm not a big fan) and somewhat muted colors. In comparison to similar shows, the animation quality of Dragonball Z is similar (but the character design and use of color is better) and Dragonball GT seems light years ahead of Yu Yu Hakusho. In terms of extras, "Dark Tournament" has a lot of the great features of "Rescue Yukina." This includes two sets of English subtitles, one more oriented at the fan who doesn't know much Japanese and one that seems more like the subtitles for fansubs (i.e., use of Japanese honorifics, Japanese move names, etc). However, both sets of subtitles have some bizarre language use; the ship's captain speaks in a sailor accent and this is represented in both sets of English subtitles as him not being able to say "h" ("have" becomes "'ave"). This is extremely distracting, especially on the Japanese subtitle track. Even if FUNimation feels the need to add dialects in the English subtitles, the more Japanese set of subtitles should stick to standard English. The Japanese style English subtitles also have some bizarre phrasing, including Kuwabara trying to inspire his friends by saying "Hike up your briefs boys," and Botan saying "That boy has grits!" Again, if FUNimation sees the need to fiddle with the subtitles, it should keep colloquialisms of that fashion in the first style of English subtitles, not in the Japanese style ones. The disc's extras include an explanation of moves and kanji in the show. Maybe less kanji and Japanese move names were on this disc, but these seemed less impressive than on "Rescue Yukina." Other extras include textless openings and closings, trailers for other FUNimation releases, and pictures of a Yusuke model that seemed more than a little like a commercial to me. On a technical level, I had a couple of problems with this disc. First and foremost, text from the DVD player was on the left hand side of the screen throughout play. I used my Playstation2 to play the disc. Though the PS2 sometimes has issues with DVDs, by now it certainly has a wide enough base to be considered a standard DVD player. I found this very odd, since "Rescue Yukina" had no such problem nor did any of the DVDs I tried after "Dark Tournament." Additionally, volume eight's menu system was rather illogical and once or twice, seemed to skip through menus on its own. Finally, the episode count on disc eight is a bit shorter than disc seven. While "Rescue Yukina" finishes that story arc in four episodes, "Dark Tournament" (while a much longer story arc) only has three episodes. The disc ends right in the middle of Kuwabara's fight in the tournament, which may be by design in order to sell more of the next disc. Overall, Yu Yu Hakusho is a fun series and disc eight is an exciting collection of fights and new locales. While FUNimation's release has its low moments, the company does a lot of things right. The two sets of subtitles and the kanji and move explanations are definitely moves in the right direction for releases of TV animation. Fans of the series will enjoy Yusuke and crew's latest adventure.